I’ve gotten farther on doing a Maker Faire demo. I am working with some folks who have a commercial booth and want spinning and weaving to show off what you can do (and, naturally, who can supply you with the materials and equipment.) They have a plan that has worked before, with CD spindles and weaving on rigid heddle looms that even fits well with the recycled them of the event. I’m fine with working on somebody else’s project if it furthers my goal of getting spinning and weaving in front of people. This means the BFL goes to something else, which isn’t a big deal. It’s fiber that has been sitting around and the yarn I started is fine for another project. I haven’t done anything irreversible. This also means I have no deadline to finish it. More on the significance of that point in another post. I do need possibly one more volunteer, which I will bring up at the guild meeting tomorrow. The exact details are still being sorted out but it won’t involve much setup in advance, just spinning and weaving on-site with everything provided (with the possible exception of a spinning wheel, which I’ve certainly got covered.) With commercial support we can do a better looking demo and have nice educational materials to hand out. Posted by feorlen on 28 March 2009 at 10:03 am under events, spinning, weaving. I started a project for the new wheel so I can take it to the guild meeting next weekend. The Maker Faire warp is on the Lendrum and I’m not hauling that anywhere, so I wanted something non-challenging to do with the other wheel. A major purpose of the Little Gem is to take it places. I pulled out some fiber I got from a swap a while back. I have no idea what it is aside from wool, but I can tell you that it’s ostensibly top (has some big ugly neps) and is bright green, magenta and black. I tried spinning it directly but the wide assortment of fiber lengths and the general untidiness made this less than satisfactory. So I tried carding it. Not very much, just lay it out on the cards and give it two passes. The rolags still have a lot of randomly distributed colors but it opens up the lumps. I carded it all so I can just bring fiber and have less to haul on Bart to the meeting. I don’t have a sample of the finished yarn because I don’t quite know what I’m going to do with it. There isn’t much, so plying it with itself won’t get me far. I’m thinking about plying it with black and making some Goth knitting yarn. Posted by feorlen on 22 March 2009 at 6:01 pm under spinning. A totally ridiculous video about sheep with LEDs. Posted by feorlen on 18 March 2009 at 10:04 am under spinning. 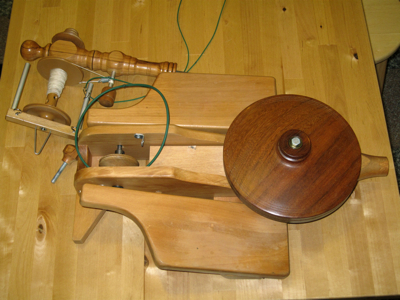 I got a new spinning wheel yesterday, a Majacraft Little Gem from a local friend who is unloading her spinning stuff. It’s seen hard use and has some cosmetic damage but is otherwise sound. I set it up and noticed it didn’t treadle as smoothly as it ought to. It could use some clean-up, being covered in lint, but after a general de-lousing it still needed some help. 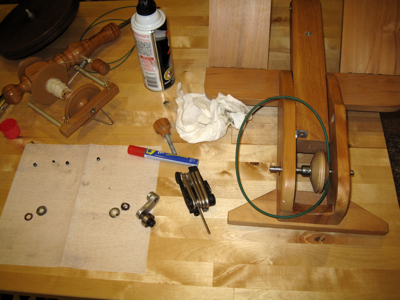 The treadle mechanism had fiber wrapped around the shaft and in general it was a bit gunky. Important Note: Professional Driver, Closed Course. Please to do not take this as license to disassemble your spinning wheel willy-nilly. Getting those little parts back together in the correct way is not as easy as it looks. Step One: find the metric hex key set. It is conveniently attached to my bicycle tool. You can field strip almost anything with this and open your beer when you are done. 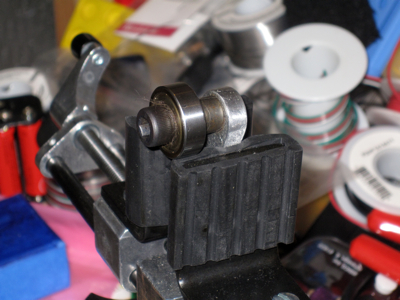 I took off the crank arms, removed the screws holding the center pulley and cleaned the shaft as much as possible. The shaft itself didn’t want to come out so I didn’t push it. With some help from my handy-dandy bench vise (and a conveniently located husband who has better hand strength) I was able to disassemble and clean both cranks. I could then use the WD-40 to clean the quite filthy parts. Put everything back together, give it a final once over with the canned air, and it runs much better. Posted by feorlen on 15 March 2009 at 9:54 am under spinning. I’m working on another Maker Faire project. The deadline is at the end of the month so I’ve got some time to pull things together. I have fiber and one volunteer, I need a larger loom to borrow and a couple more people. Depending on what happens in the next couple weeks, I’ll adjust the scope of the project. I am talking to some people about getting educational materials to hand out. The idea is to show the process of creating fabric from raw fiber, with carding, spinning and weaving. I have additional fiber and fabric samples as well as a simple loom and spindles people can try. I don’t intend to make it a spinning lesson, the size and noise level of the event make focused teaching difficult, but an active demo with several different stations showing the process. Check out the project page if you are interested. If you are a Bay Area spinner and want to participate, let me know. Maker Faire is a hard event to drop in for a few hours, so I’m looking for people who can commit for at least one full day. I’d like to have at least 4 people each day, 5 would be nice so there is more time to see the rest of the event. 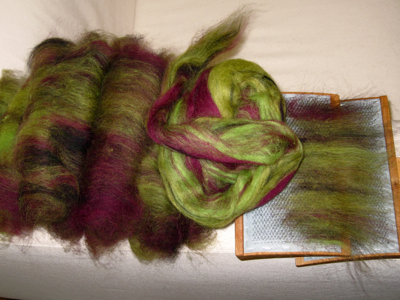 Posted by feorlen on 14 March 2009 at 4:49 pm under events, spinning, weaving.